Yes, they’re mean, they make you feel horrible at work and they’re downright passive-aggressive. Sometimes you think that just handing in your resignation letter will be your ticket out of there, but you need that sweet moolah. But you’re in your twenties now! It’s time to use that big loud voice of yours, because you don’t let rudeness slide. You stand your ground. No one deserves workplace bullying, so you speak up and put them in their place. If you genuinely don’t enjoy your job, it’s time for a change in direction. Your boss’s attitude might just help you grow into someone who speaks their mind and moves on to take greater opportunities. Remember, when one door closes, another always opens. This isn’t limited to a boyfriend or girlfriend who does something awful to end your relationship. It could be a best friend you’ve had for a long time, or even a family member. Heartbreak is unfortunately inevitable and hurts like hell – but provides you with a huge opportunity for growth. It will stay with you as a reminder that you can’t trust everyone (as sad as it is), but there are always people around who will be there for you – remember that! Just like the horrible boss, you start counting down the seconds until your shift is over when you’re stuck with this one. They may be super sweet, but they annoy you – a lot! 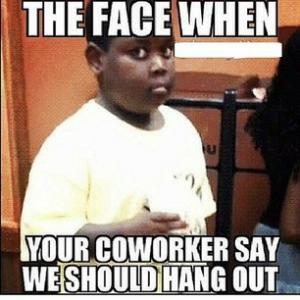 He or she will push to make plans with you to hang out after work hours, which can be a tricky one to get out of since you see them almost every day of the week. They follow you around like a lost puppy and tell you jokes that you fake-laugh to, before walking off with your eyes rolled. But don’t be that person! You don’t have to be best friends with them, but instead of having a two-faced attitude, be more real with them and you might be surprised. 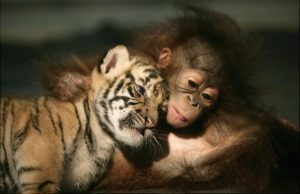 Sometimes opposites attract, and unlikely friends become unforgettable friends (source). Maybe they’re a vegan and you’re the world’s biggest carnivore. Or, they’re strongly liberal and you’re deeply involved with supporting the labour party. Perhaps your relationship started off quite heated with strong differences, but suddenly a friendship blossoms and you never want to let go of them. It’s true that opposites attract, and you never know, this unlikely friend just might be a friend for life. We all need a helping hand (source). We all need someone to lean on. Whether this is your mum, a uni lecturer or a family friend, there will be someone that you look up to. It might be the mentor of your first career move or living a different way of life. Whoever they are, appreciate them. Our strongest role models define who we are and the lives we live.